German Luftwaffe Messerschmitt Bf 109 F fighter plane. 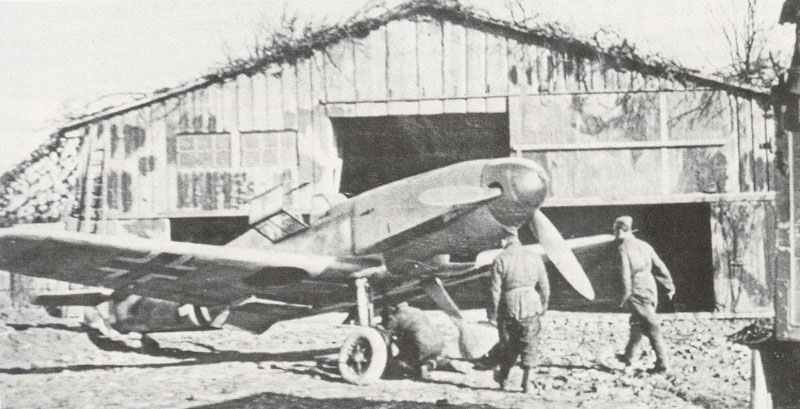 This Me 109 F is standing outside a hangarette camouflaged as a barn at an airfield in northern France. Type: German Luftwaffe fighter plane. During the period of the manufacturing of the Me 109 E for the German Luftwaffe, Messerschmitt was creating what was to turn into the best of the many variants, the Me 109 F. Operated by either a 1,200hp DB 601N or a I,350hp DB 601E power plant, the Me 109 F shown a significant progress over previously models when it comes to both performance and cleanliness of line, and finally offered the Luftwaffe a fighter that could outmaneuver the Spitfire V.
The complete fuselage had been better aerodynamically, concluding in a more curved rudder, an unbraced tailplane along with a retractable tail-wheel; the wings, of marginally improved span, were curved off at the tips; and performance at all altitudes was superior to that of previous versions. This Messerschmitt Bf109 F is carrying on its nose the cockerel’s head insignia of III.Gruppe (group) Jagdgeschwader (fighter group) 2. The vertical strip on the rear fuselage confirmed that the aircraft belonged to III.Gruppe and the chevrons in front of the fuselage cross indicated that it was flown by the Gruppen Commander. 3D model Messerschmitt Bf109 F-4. Manufacturing series ran from F-1 to F-6, with a variety of sub-types. Several F-series planes were utilised as testbeds, the products examined including BMW 801 (radial) and Jumo 213 motors, a V-type tail device, rocket weapons, and a nosewheel landing gear. A prototype never flown, but none the less of fascination, was the Me 109 Z of 1943, by which a pair of Me 109 Fs were ‘twinned’ by linking them by a fresh, common wing centre-section and tailplane, the single pilot being intended to take up a cockpit in the port fuselage. By 1942 the Me 109 F had been replaced in manufacturing and service by the most numerous model, the Me 109 G, called ‘Gustav’. Users: German Luftwaffe (for Bf 109 F). Tagged 1941, germany, luftwaffe, me 109, messerschmitt, single-seat fighter.